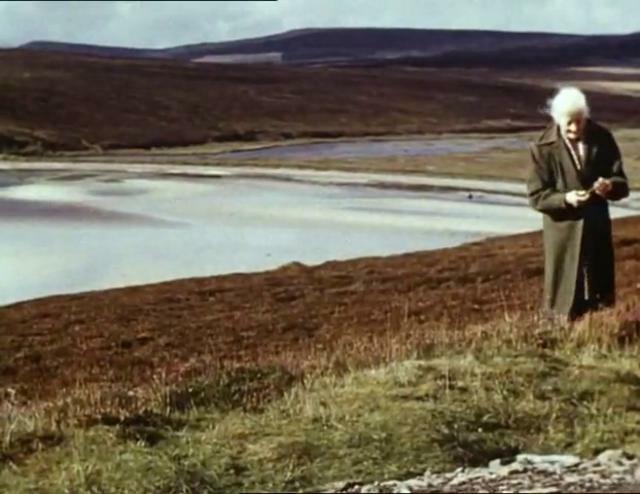 In making a short film about her mother, the experimental filmmaker, Margaret Tait, essentially drew upon an interesting dialectic between place and youth. With 1952’s A Portrait Of Ga – a 4 minute short, shot on 16mm and with a voice-over by the filmmaker herself – a fragment of biography (and serendipitous autobiography) becomes a joyous affiliation between a happy sense of place and a jocose portrait of the filmmaker’s mother. Known as “Ga”, a name that the film suggests was given to her by her grandchildren, Tait’s mother is shown throughout the film to engage in the everyday rituals of walking along paths and scraggy, grassy knolls, eating sweets, smoking cigarettes and dancing. Yet the effectiveness of the film is the placement of all of these actions within a wider landscape, of both a topographical and of an emotionally platonic character; in emphasising the ordinary with a quiet knowing, Tait imbues the film’s collection of moments with a higher sense of purpose. A Portrait is, at the very least, a monument to small and personal moments. The calm simplicity with which Tait works makes deeper readings seem crass but there is an impression of ineffability surrounding these rituals. However, as Tait herself suggests when discussing why she made the film, it was more to do with a personal interest in creating a maternal portrait: “My mother seemed a good subject for a portrait, (she was there), and I thought it offered a chance to do a sort of ‘abstract film’, in the sense that it didn’t have what you might call ‘the grammar of film’. It’s mostly discontinuous shots linked just by subject, in one case by colour, only rarely by movement.” (source). A number of interesting points are raised here. Tait suggests that the editing of the film is mostly ungrammatical, with what appears to be little actual post-editing to the footage and with only one moment of editing in camera (i.e. planning the shot) to connect a moment of connected colour (a reoccurring theme for the artist). This ties with the logic of a place-memory; the original film reel collating bits and bobs of Ga’s life and home on the Orkney Islands with a generally unbiased eye. In other words, the shooting seems to be momentary, instinctive and personal rather than academic or tied to narrative tendencies. 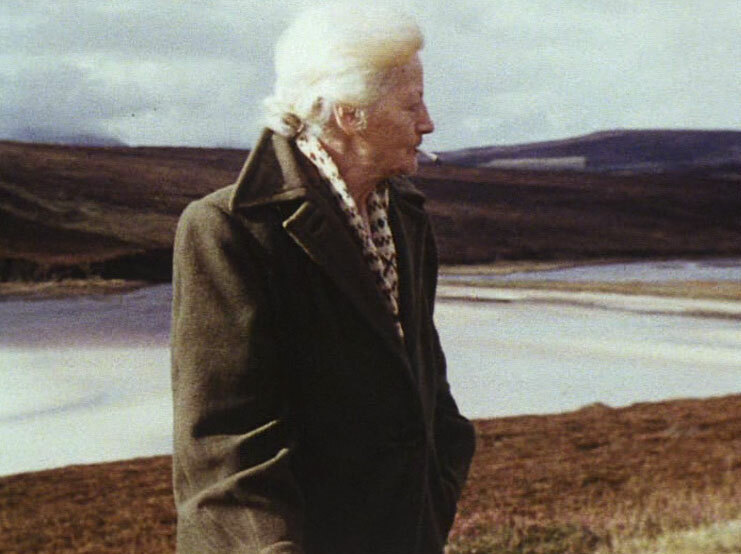 Perhaps because of the inherent Scottishness of the film and its subject, A Portrait, and Ga herself for that matter, brings to mind the writing of Nan Shepherd. Shepherd writes of a fluency of walking pace that is gained from exploring more mountainous paths (or at least paths less travelled). She writes in The Living Mountain of this fluency of foot: “Eye and foot acquire in rough walking a co-ordination that makes one distinctly aware of where the next step is to fall, even while watching sky and land.” (1977). In a similar fashion, A Portrait‘s opening shot shows Ga walking and ascending a road-side hill towards the camera with total dexterity; earnestly walking off the easy, tarmac path in order to pick a flower, to sit in the grass and to have a smoke. The film continues in a similar fashion with virtually every shot of Ga outside showcasing her hopping and jumping around grassy patches and fields with a youthful exuberance; part of the film’s charm is its sense of total, youthful abandon. She embodies with total ease, Shepherd’s most famous phrase of “It is a grand thing, to get to live”. Place plays its role in this abandon, just as much as the sticky unwrapping of a boiled sweet does in another segment of the film. Perhaps there is even a rebellious hint through such a playful relationship with the landscape; Ga, when on an obviously easier terrain such as the tarmac road, even starts to skip and break into little runs as a faded rainbow hangs over the hills. She even breaks into a dance when back in the confines of her own garden, when not digging and tending to the plants that is. The sense that the place has imbued in her a constantly young bearing is perhaps less to do with Tait’s editing (or lack of) and more to do with her subject, but her capture of it is still warming and masterfully subtle. Ali Smith has written of A Portrait‘s wonder and her thoughts tie well into Shepherd’s own vivacious sense of aliveness. Smith writes the following on the shot of Ga running along the road: “A long-shot of her mother, from behind, almost running almost dancing along a rural road beneath a greyed-out rainbow is, in that miraculous Tait way, so placed, so unquaint and so natural, as to leave its viewer renewed and knowing again what it is, simply to be alive.” (source). How appropriate it is then to finish the film with Ga yet again climbing another grassy hill, this time in more windy weather as the quote which opens this article closes the film; leaving the viewer as youthfully renewed as an old Scottish grandmother finding childlike exuberance in walking up a windy, Orkney hillside.